You are here: HomenextTopicsnextViews of the city: images & opinionsnextMystery photos of Brighton and HovenextHove Seafront c1910? This photograph was taken c1910 and features Hove Battery. But what was the large building on the right of the photo? If you can identify it – or have any information to share, please post a comment. Most likely the coastguard blockhouse. These were built to help prevent smuggling. The Coastguard cottages were further up Hove Street, next door to the Ship. The 1932 OS map has the area of the present King Alfred defined as “Coastguard Station”. The low buildings in the foreground are definitely the Coastguard Station, I imagine the house behind has some relation, perhaps the Coastguard’s house. Yes, an original building used by the coastguard, (likely built to deter smuggling), demolished in October 1969. 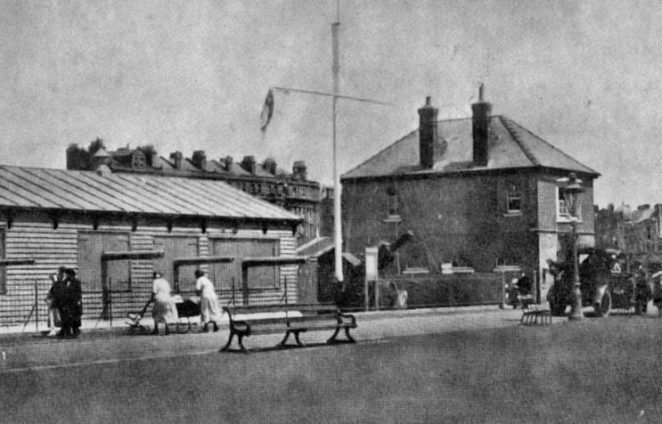 I have directories of Brighton and Hove and the 1917 edition of Pike’s Blue Book has a map and designates this as Medina Esplanade with the battery clearly marked, however, there are no entries for Medina Esplanade in that directory. In the 1908-9 edition of Towner’s Directory there are listings for Medina Esplanade but I am not sure they help. Next to the battery is Casa Amoena, Sutherland Duchess of; then St Aubyn’s Residential Flats and other buildings are entered after these, going east. The building in question doesn’t look like a Casa Amoena though – unless it was a mere shadow of its former self. Further to my previous comment, I have been looking at photos in the James Gray collection, via the Regency Society website, and picture 108 in Volume 12 features this building and the text states the building was used by the coastguards. The photo was taken in 1968 and the buildings were demolished in 1969 – according to the text, which also says that the house was lived in until a few years before the date of the photos and it was demolished in October 1969. It still doesn’t tell us whether it had a different use before that of the coastguards. During the period that HMS Sussex RNR occupied the Battery complex the cottage was used by the duty shipkeeper who effectively was the caretaker/nightwatchman. I am interested in the smuggling references. Does anyone have any infornmation they could share with me about smuggling in Hove? This is just anecdotal but my close friend lived in St Leonard’s Road, Hove, in the 1950’s, until she was about 9. She was told there were tunnels and caverns, beneath their house, which linked to the beaches, and that they had been used by smugglers. I am not sure but there may be something to do with the area called Copperas Gap – I am sure there will someone on the mailing list who could help a lot more. Casa Amoena had an amazing turret. Rather gothic and vertical in nature as a building. It was on the esplanade at the bottom of the St Aubyns South road between itself and St Aubyns Mansions. It was demolished to make way for the construction of the King Alfred in 1938. Also interesting is that the RNR had the ‘right to shoot’ across the road and out to sea in an emergency. Out of interest, in the early 1960s I recall an RNR training establishment referred to as King Alfred. If I remember there was also the King Alfred Baths and a Ten Pin bowling alley there as well. Is this the same place, if yes does it still exist? My great grandfather was a Coast Guard and lived in 4 Coast Guard Cottages, Hove (1891 Census). Does anyone know if there are any pictures of these cottages? We believe that this picture https://www.flickr.com/photos/hwmobs/6552578533/ could be the coastguard cottages in Hove. Positive identification would be welcome. The James Gray collection at the Regency Society says this house was used by the coastguards whose dwellings were on the site of the van hire facility at the bottom of Hove Street, opposite the King Alfred car park and on the other side of the road from Viceroy House. The house, above, was on the site of the car park and was lived in until it was demolished in 1969. See vol 12 pic 12 at James Gray. To Alastair Disley and Sue Warner: if you go to Vol 12 of the James Gray collection on the Regency Society web site, you will see a few photos of the old coastguard cottages before they were demolished in the 1930s or so. They do look like the cottages in your photo. Thanks to all for your help, the tentative identification was made by reference to maps, street patterns, and other non-identical coastguard cottages elsewhere, so it is fantastic to have a photograph to compare it with. The previous photograph http://regencysociety-jamesgray.com/volume12/source/jg_12_103.html shows almost the same view as our mystery photograph, putting the attribution beyond doubt. It is evident that at some point after 1908, the coastguard cottages had their lower floor painted or rendered over the original brick. Thanks once again. A 1920s hotel - do you recognise anyone? A First World War soldier? A rave from the grave! Can anyone identify this school? Can you identify this Brighton school? Can you identify this Brighton street? Can you identify this busy shopping street? Can you identify this church? Can you identify this house? Can you identify this location? Can you identify this pub? Can you identify this school? Can you identify this steam lorry? Churchill Square - but what date? Coins and medals in The Lanes? Date of this Brighton Borough Police inspection? Do you recognise these shops? Do you recognise this garden? Do you recognise this house? Do you recognise this location? Do you recognise this shop? Do you recognise this street? Do you remember this road? Harrimonds 1962 - recognise anyone here? Is this a Brighton street? Is this another Oak Apple Day outing? Is this St Luke's School? It's 1950s - but where is it? Men's group outing - can you identify anyone? My Brighton Festival Day Ends with a Mystery! Polish Sailors help with the Harvest? Taken in 1963 - where is it? Was this outside Brighton Town Hall? When was this photo taken? Where and when was this photo taken? Where is this street in 1860s Brighton? Where was the Battle of the V1 filmed? Where was this 1970 disco? Where was this Hollingbury bus photographed? Where was this model train? Where was this tobacconist shop? Where was Woodingdean Post office? Which CVA factory was this? Which pub in Albion Hill? Who are these musical gents? Who are these smart little chaps? Who was Sergeant S. Elliott? Wiles Photographer from Hove - "1920 Football Crowd"